Our primary goal is to provide the best in personalized, professional veterinary care for your dog, cat, or any other animal. 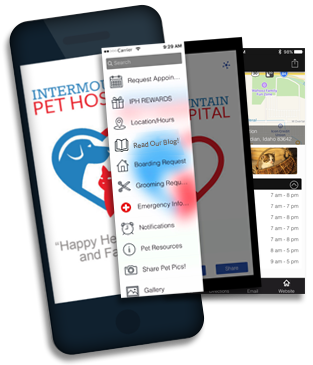 We at Intermountain Pet Hospital have worked hard to stay on the cutting edge of veterinary medicine and practices. Investing in the latest and best equipment that allows us to offer the best in preventative, diagnostic and treatment services to our clients and their beloved pets. Fill out the form to get your coupon now! - Tracy and Ron Everyone was so nice and they were great with my cat (and my kid). There was very little waiting and they took the time to listen to my problem and offered solutions instead of putting me in the corner. They also made sure I was comfortable with what to do once I got home to give my cat medicine. Intermountain Pet Hospital is the best clinic I have been to. Thank you all!